Puig is the only physicist who has studied the breadth of the underlying physics of the game, during the actual game. Let’s look in detail at just a few of the experimental investigations he has completed. We’ll start at the plate. 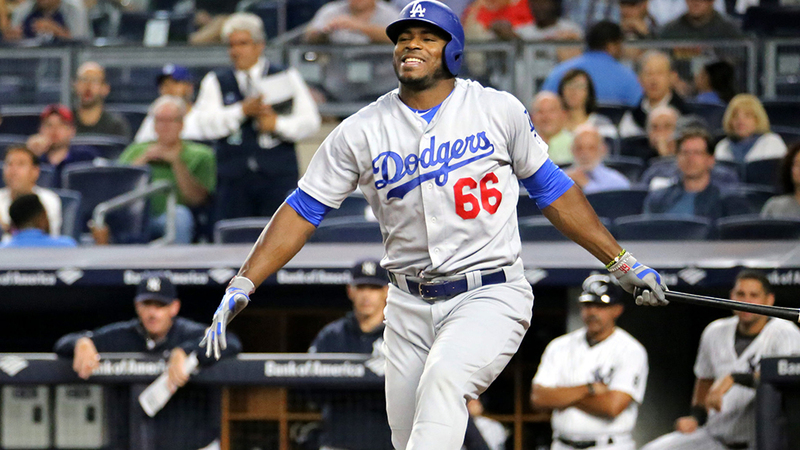 Puig has done repeated tests of the breaking strength of bats. Others have described this interaction, but they haven’t experienced it. Here is just one of many examples of Puig’s little-appreciated knack. At some point Puig – or some other scientist – should address the resulting effect on the batter’s legs. That just has to leave a mark. Bat flips are an elegant bit of physics, described by breaking up the motion into the trajectory of the center-of-mass of the bat plus the rotation about the center-of-mass. Puig is one of the masters of this art form. Here is an example of one of his data collecting sessions. Still not convinced he’s a physicist at heart? How about his speed tests on the bases? Below is an example where he apparently records his fastest triple in many years despite seemingly not running with full effort throughout. At the end, Puig also seems to be conducting some experiment involving a unique type of oscillatory motion. Whenever a player slides, he is slowed by the frictional force exerted on him by the surface. Yasiel has conducted numerous studies into the frictional forces on the several different surfaces the diamond provides. Here, he measures the frictional force created by the outfield turf. And he has done comparison studies between the friction created by the outfield grass and the warning track. Here, he strangely underestimated the frictional force, and required some additional force provided by a wall to be brought to rest. Puig has also compared the frictional force that is generated by the outfield grass and the warning track with that created by the infield dirt. Below he seems to be trying to explain his results and data with the umpire, who seems to have little interest in physics. Still not a believer in Puig’s scientific bona fides? Will examining his experiments on baseball trajectories help? The trajectory of a baseball is very complicated to calculate. It requires knowledge of not only the launch angle and launch speed, but also the intricate behavior of air interacting with the ball. Clearly, Yasiel has developed flight models of the highest accuracy. If all of these examples of Puig’s physics prowess have yet to convince you, perhaps the fact that he possesses one of the most noteworthy character traits of a physicist – or at least, the proverbial, absent minded professor — will help make close case. Here is an example of a bit of his distracted behavior, this time on the bases. There are more examples similar to this episode. That’s the thing about academic absentmindedness – it crops up in all aspects of one’s life. Below are a few such moments in the field. Thus we are left to conclude that Yasiel Puig exhibits so many traits of a physicist that he must be one – at least in spirit. Dodgers fans certainly loved his scientific technique. Perhaps the Reds are an organization that more deeply appreciates scientific expertise. In time, their fans will likely come to enjoy Puig’s experimental approach just as much as did the denizens of Chavez Ravine. Great article. And a +1 for you, nenright. And the videos were fantastic, both showing his prowess and, uh, otherwise. Yes that throw was amazing! That’s the non-arguable part about Puig…he has some of the most incredible tool sets I’ve seen in my 50+ years of watching baseball. And as a Giants fan, I’m going to miss him with the Dodgers a lot, too., LOL. Hating him as a Red will be like hating the Raiders without Al Davis….just not as fun. Have to go with the Cowboys and Jerry Jones now, I guess. 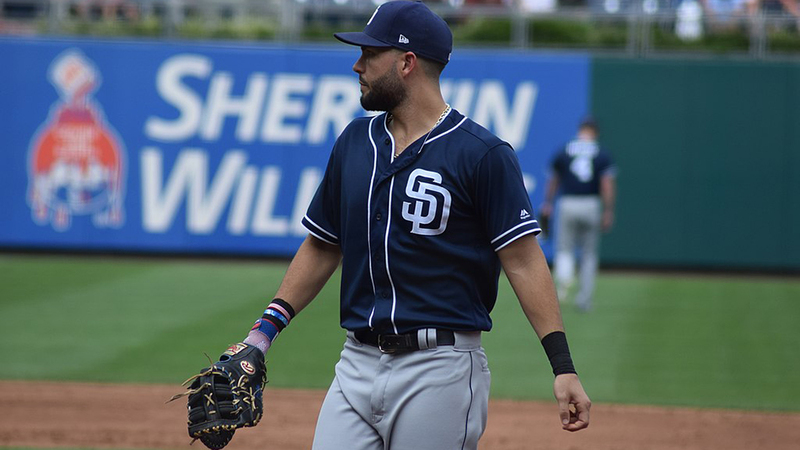 that play– missing the fly ball, then grabbing the ball and heaving to third, without time to set up, absolutely perfectly for the out– is the epitome of right field defense. I came to this article hoping to learn that licking ones bat, and the subsequent saliva left behind, actually adds loft/reduces wind shear/etc. I leave only mildly disappointed. Do you know the date of the game in the last clip, with the strikeout looking? I want to see if I can find a strike zone plot for that at bat. Strike one looks generous but not egregious, but strike two looks well outside and strike three looks well inside.